Hey there! It’s Friday and it’s been a BIG week at our house. If you follow me on instagram and saw my story, then you already know why, but I’ll be filling you in here next week as well. So stay tuned! 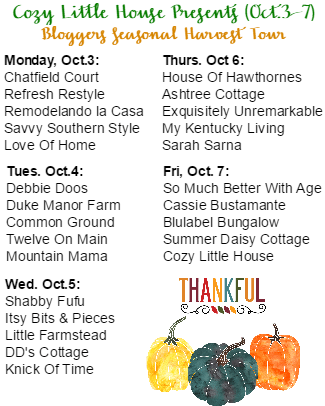 Today though I am joining Brenda from Cozy Little House on her Bloggers Harvest Tour. If you are popping by from So Much Better with Age, welcome! I love Jamie’s warm and inviting home. 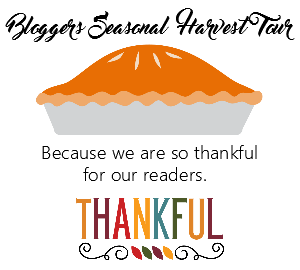 Since I’ve shared my fall home tour and fall porch tour here, I thought today would be a fun opportunity to create a bohemian rustic vintage fall tablescape for you. Lately, I feel like I am starting to get really into vintage tableware, like the amber goblets that started me on this table. Clearly, I need to start doing more entertaining so I can have a giant stash on hand. The goblets that I found and the tiered pumpkin centerpiece I created are what inspired me to create this tablescape, along with a vintage macrame runner I found for just a dollar when I got the goblets. At the risk of things getting a little too gramma for my liking, I needed to bring in some rustic and masculine tones. 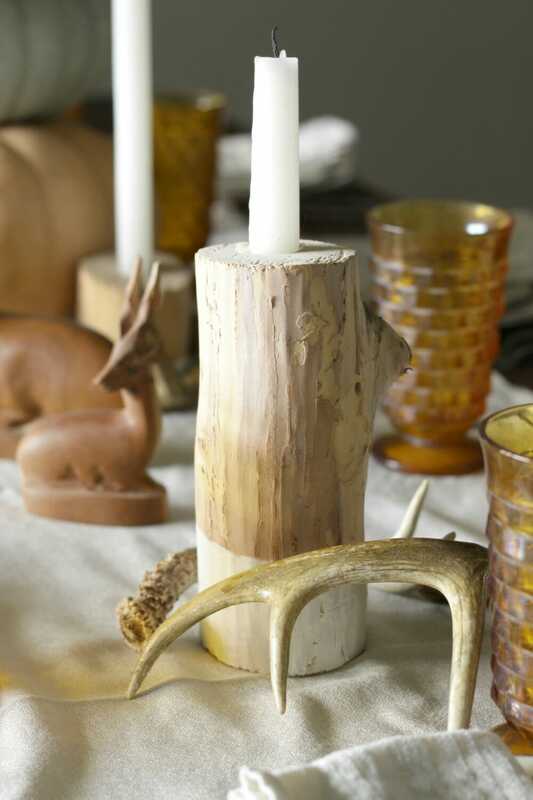 I had plenty of these vintage carved antelope and antlers on hand, so added them to the mix with log candlesticks I created a couple years ago. If you don’t have access to fallen limbs and power tools, these candlesticks are similar. I am very fortunate to have my grandmother’s old ivory and platinum Lenox china, and I thought it would be perfect with the ivory runner and also add a fancier touch to the mix. I brought in some metallic and cream napkins and my peacock silverware by Wallace, which sadly has been discontinued. Everything came together to create a warm space…. I always thought I preferred white over ivory, but I love ivory in the fall. It certainly lends a cozier touch than pure white. Fall is all about the warm and natural colors, and these goblets really bring that essence to my table, capturing the light. (You can find the same exact goblets here!) My home is full of blues and greens, so the warmer colors add a great contrast as well. I think these guys might be my favorite addition to the table… I always find them so peaceful for some reason. If you are hosting Thanksgiving or any fall get togethers at your home, I hope this table inspired you and showed you that you don’t have to spend a lot of money. 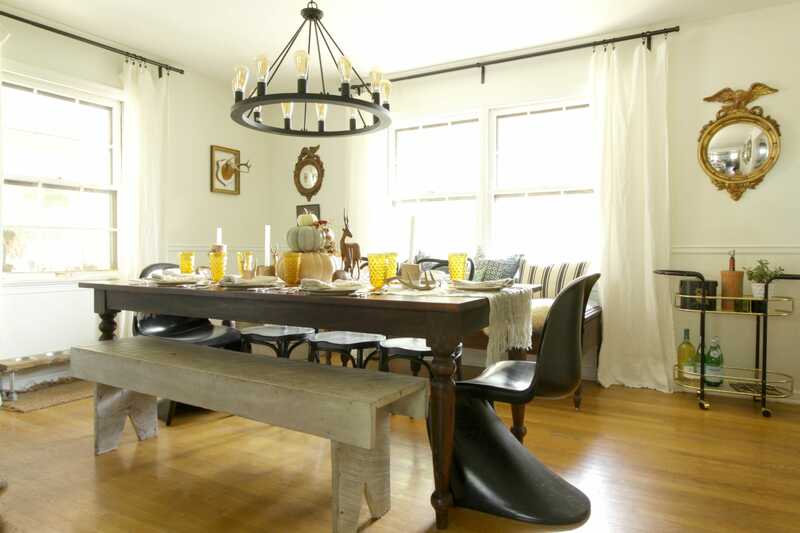 Just use what you have, thrifted finds, and natural resources, and you can create an inviting dining space. Thank you so much for checking out my dining room tablescape today! Now head on over to BluLabel Bungalow to check out Erika’s beautiful home! And please find all of this week’s tours below! thank you so much, anita! i really appreciate it! and i need pink! i want to get a shelf for storage and have every color available because i am crazy like that. I used to have blue goblets just like your amber ones. Wonder where they got off to? I love your wonderful mix of vintage, bohemian, feminine and masculine on one table. No man would feel odd sitting at your table! I thank you so much for joining in. Always love to see what you come up with, and you never disappoint! aaaaw, thank you so much, brenda! thank you for being such an amazing hostess! Cassie, I love ivory in the Fall, too! 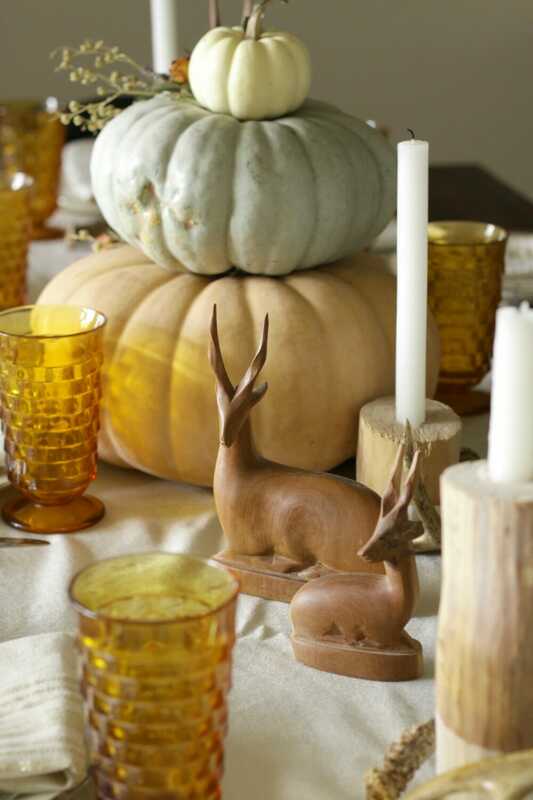 Thank you for sharing your beautiful home and how you set the table for Fall. I’ve scheduled many pins from this post – the amber goblets add so much warmth and texture! thank you so much, sarah! i appreciate it!!! Love the mix of colors and textures. The amber is so pretty with the ivory. I get the feeling that our houses have very similar floor plans. My house is a Cape Cod as well, but with some additions. I’m constantly trying to figure out a way to rework some rooms, so I’m always looking for inspiration. 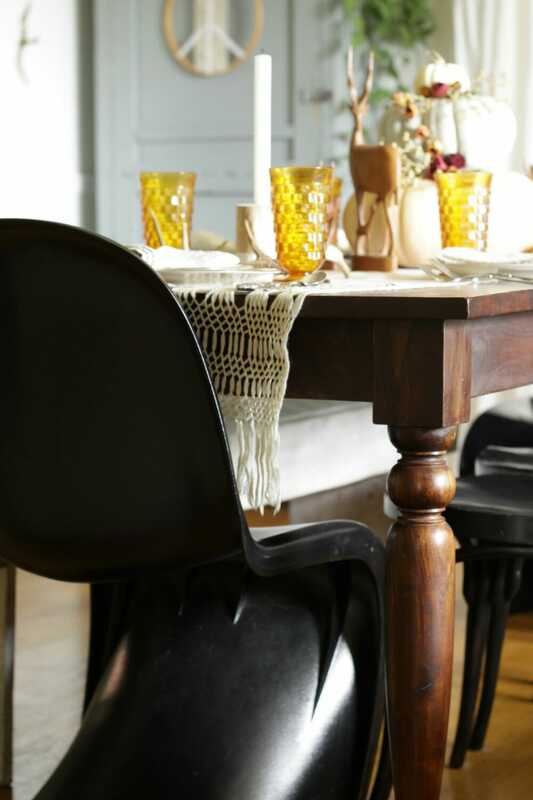 This is such a lovely table…I love everything about it! 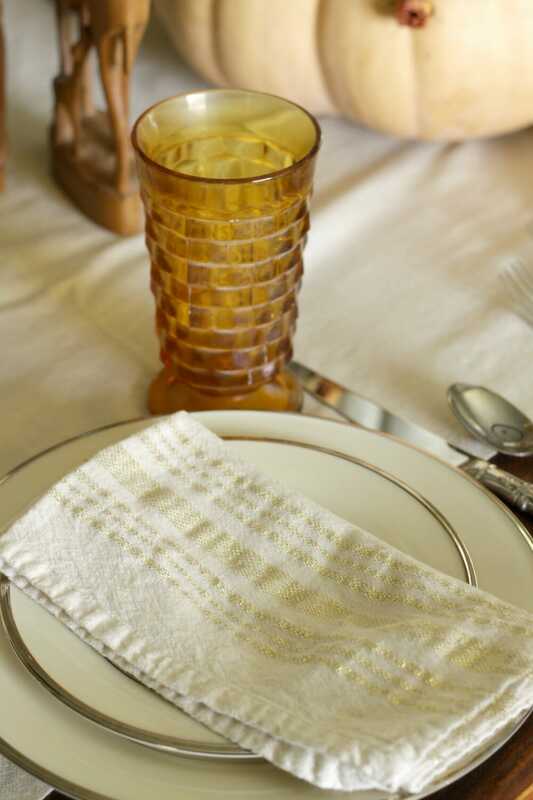 I love how you used the golden glassware…that might have to be on my radar when thrifting! Thank you for the beautiful inspiration, Cassie! thank you so much, linda! i know- i am now addicted to finding vintage glassware in all the colors! It’s all lovely Cassie. You’ve got me wanting to make some candle sticks from some of my wood logs. Lenox Solitaire is my wedding china and I love it. I’m envious that you have a whole set – mine is VERY partial. I can only use it for small intimate affairs! Back when your grandmother and then I selected this pattern it was only available in ivory. FYI the ebay link you shared is not for Solitaire. 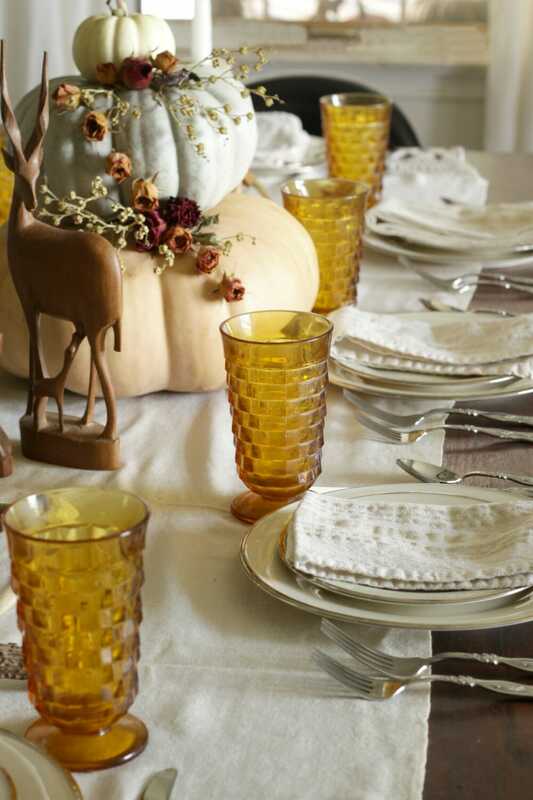 I adore any amber glass so right away I was drawn to your tablescape! I’ve been collecting it for years from various yard sales and antique shops and it always makes a special appearance in the fall. 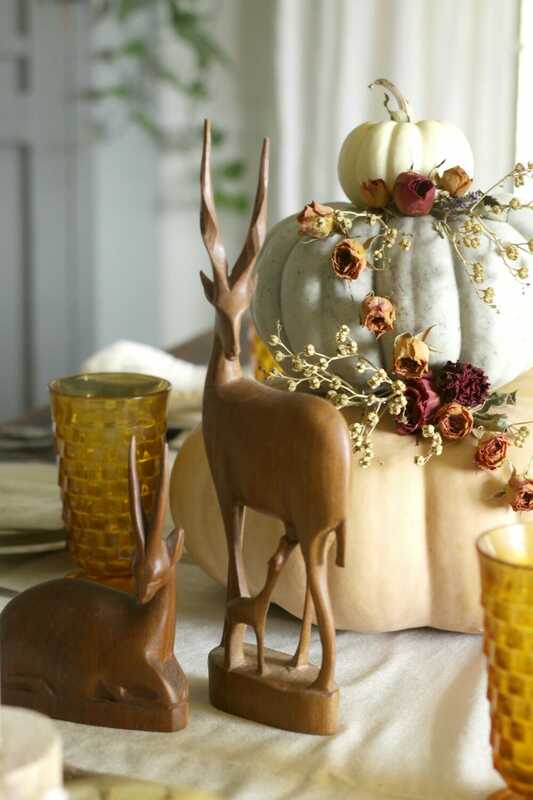 Love your tablescape – the addition of the antelope really ground the display! Gorgeous!! very pretty Cassie! I want the details on the blue pillows in the background. 🙂 pretty please. thank you so much! they are super old from silk & burlap- wholesale co is vintage vagabond. the striped ones i made from ikea rugs. effortless chic style. we used glasses like that forever when I was growing up. thank you so much, laura! that is awesome that you had them! Love your Bohemian rustic mix, Cassie. Pretty table and happy Fall! thank you, kim! happy fall! I love every. single. detail. Perfection!!! What a beautiful table. Your centerpiece is stunning..simple and elegant. Hey! I have a couple of those macrame things!! I guess I should drag them out? you should give them to me! I love this Cassie! So gorgeous and original. And those pumpkins though…amazing idea! thank you so much, jamie! i appreciate it! Your antelope guys (girls?) are too cute! 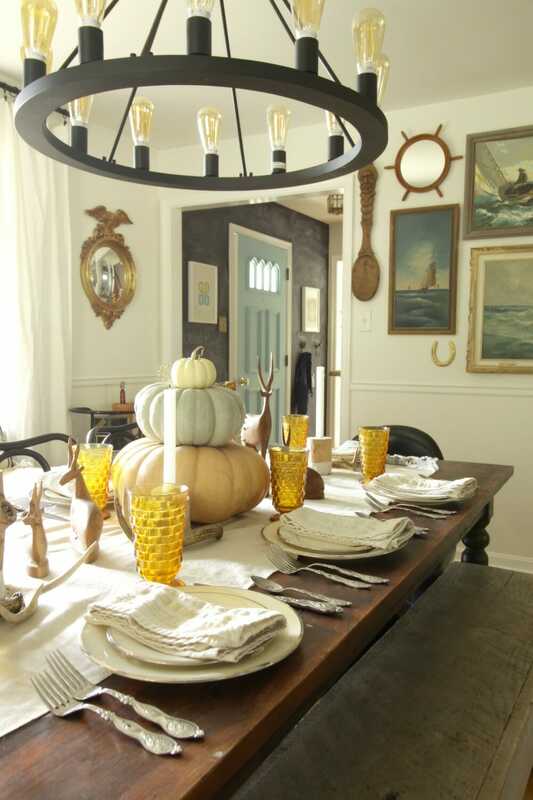 Love all the vintage items mixed in with that AMAZING pumpkin tower!!! You have a great bohemian style! i think they are both… maybe? haha! thank you so much, pam! i appreciate it! Beautiful and inspiring! Did you get rid of your buffet/sideboard???? i did!!! i replaced it with an antique day bed that actually serves our family so much better! Simply gorgeous! The goblets plus the ivory and wooden tones create such soothing setting. 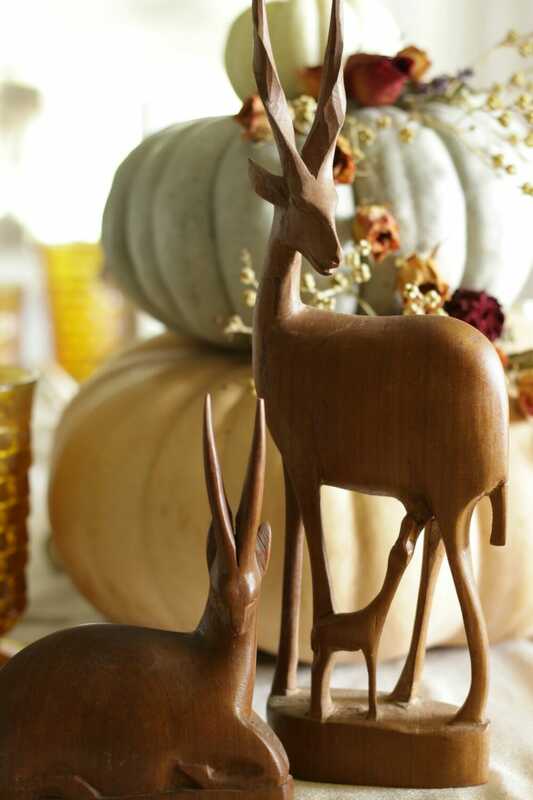 Love LOVE those wooden antelopes! thank you so much, cristina! i love the antelopes, too! Just lovely–those glasses are perfect for fall! thank you, gretchen! i love them! This table is beautiful! 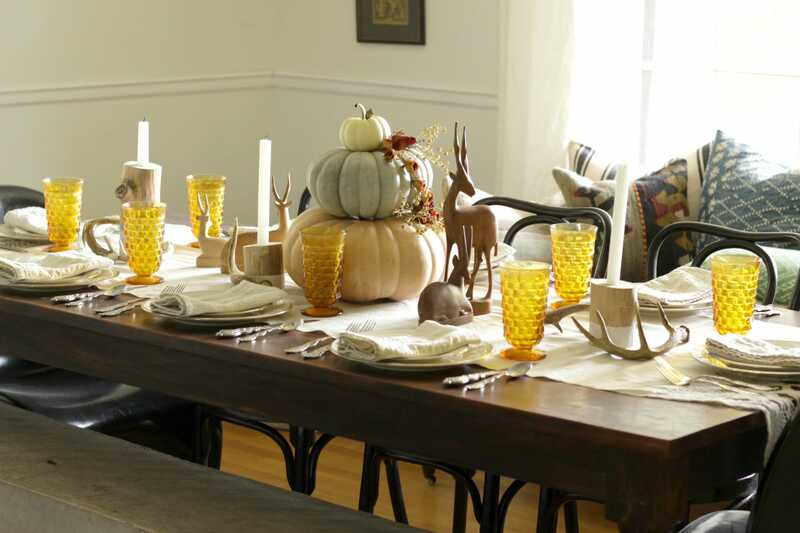 Love the macrame runner with the amber goblets, log candle holders, and the pumpkin centerpiece. SO many great textures and details Cassie. Happy Fall! thank you so much, kathy! happy fall! Absolutely stunning! I love the amber glass SO MUCH! This tablescape has to be one of my favorites ever! thank you! i never knew how much i loved it! i have some amber bottles making their debut friday for my halloween tour. 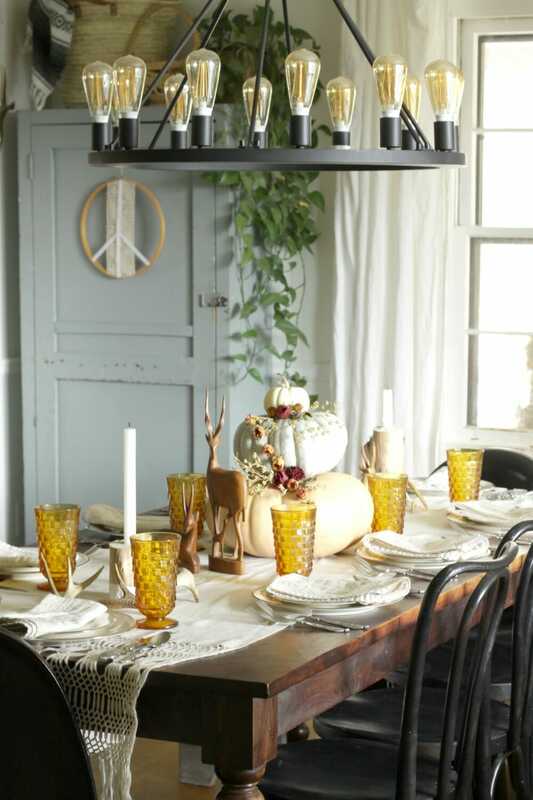 Love your bohemian rustic fall table and the amber goblets are the perfect touch. Beautiful!